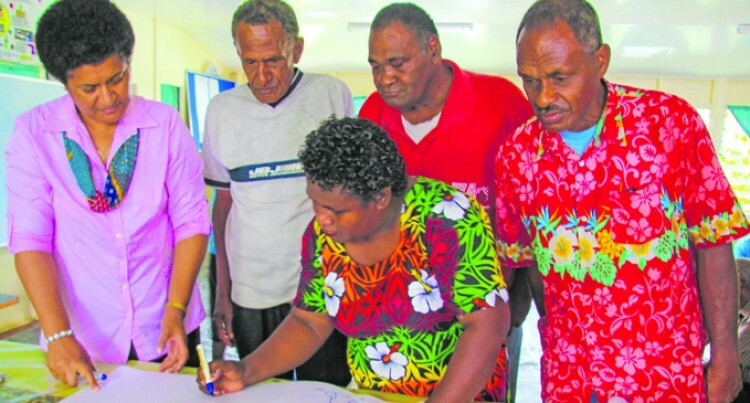 From left:Fiji Crop and Livestock Council chief executive officer Jiu Daunivalu, Lavenia Tamanivalu a dalo and yaqona farmer from Burerua, Tailevu draws a value chain while the other farmers looks on. More than 60 ginger, cocoa, and dalo farmers from Tailevu took part in a one-day Ministry of Agriculture workshop at Korovou Agriculture Station. It focused on increasing their understanding of the importance of financial literacy and the value chain benefits of farming. In addition to the Ministry participants also included representatives from the Fiji Crop and Livestock Council (FCLC) and the Fiji Development Bank (FDB). FCLC chief executive officer Jiu Daunivalu said that for farmers to understand the value chain process would be of great help to them. Especially exploring ways in which they can increase their income and develop a better working environment. This group creates the conditions in which the private sector can do business, primarily the responsibility of Government. “What this means is that using the value chain, farmers will have access to services, (inputs, credit, transport, advisory services) farmers will have access to bilateral relations with supporters, and farmers will have improved relations with the public sector. “Understanding the process will provide business opportunities for which farmers and firms need to collaborate. “It will help clarify much misunderstanding and overall create a stronger environment in which all involved will benefit,” Ms Danuivalu said. Farmers were told about FDB agriculture services and requirements available through the bank as well as basics in financial literacy. Ms Daunivalu said that FCLC would be working closely with FDB in promoting the value chain process to farmers.